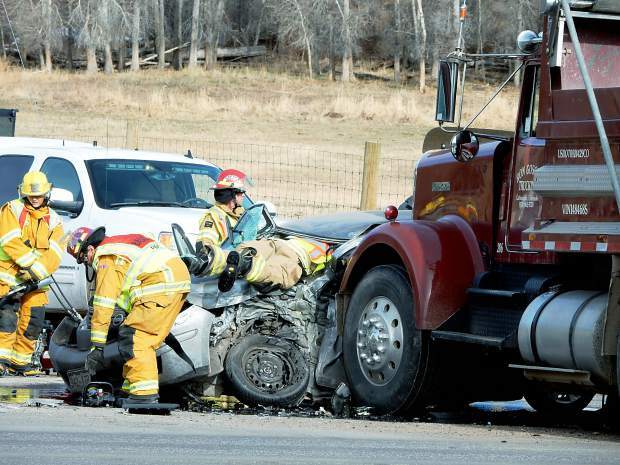 A Glenwood Springs woman was in serious but stable condition at a hospital Tuesday after authorities said she ran a red light at Highway 82 near Catherine Store and was struck by a turning dump truck. Claudia Rodriquez, 24, was given a ticket for careless driving, according to Sgt. David Evridge, of the Colorado State Patrol. Rodriquez was traveling westbound or downvalley on Highway 82 in a 2012 Nissan Versa. The dump truck driven by Ronald Goscha was eastbound on Highway 82 and turning north onto Catherine Road, also known as County Road 100, according to the State Patrol investigation. Goscha was turning with a protected green arrow at the traffic signal, Evridge said. Basalt Fire Chief Scott Thompson said the driver’s side air curtain deployed in the Nissan and possibly prevented more serious injury. The support column directly behind the driver gave way so the entire roof collapsed, he said. The extrication was complicated, Thompson said. The dump truck was disabled in the crash, so the Nissan had to be pulled away before extrication could be completed, he said. While Basalt firefighters were helping at the accident scene, the fire department received a second call for a vehicle on fire on Highway 82 at Lazy Glen. The eastbound lanes of the highway were temporarily closed while firefighters extinguished the blaze.